At least 37 people were killed in drug-related violence in Mexico over the weekend, the Daily Mail reports.The weekend surge, which hit the major cities of Guadalajara and Monterrey, indicates that violence is quickly spreading beyond the traditionally dangerous regions along the U.S.-Mexico border. In Guadalajara, Mexico’s second largest city, armed men opened fire and tossed grenades into a crowded nightclub early Saturday morning, killing six and wounding at least 37 people. This is the second grenade attack in the city this year. The once-tranquil western city, known for mariachis and tequila, has seen a marked rise in criminal activity over the past several months. The violence has raised concerns about whether Guadalajara will be able to host the 2011 Pan American Games in October. Also on Saturday, eight people died in a police shoot-out in the prosperous northern city of Monterrey. The city, which lies at the intersection of major drug smuggling routes, is the site of an ongoing turf war between the Gulf Cartel and its former allies, Los Zetas. Suspected drug hitmen kidnapped and killed a senior police chief there Sunday night, according to Reuters. A drive-by shooting killed two women and six men on the outskirts of Mexico City Sunday. One of the women was found naked on a nearby street after she was shot in the head. A seventh man was severely wounded. Eleven people were killed in separate incidents over the weekend in the deadly border city of Ciudad Juarez, just across from El Paso, Texas. 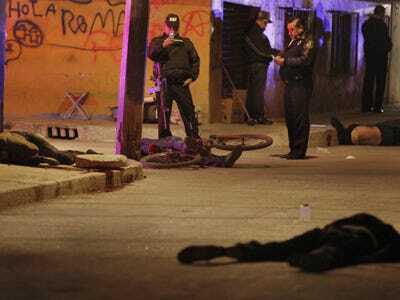 Five more people were shot and killed on the highway between Juarez and Chihuahua City, the capital of Chihuahua state. More than 34,600 people have died in Mexico’s drug wars since President Felipe Calderon initiated a crackdown on cartels in December 2006.